NEW YORK, NY -- (Marketwired) -- 05/16/16 -- Consolidated Edison, Inc. (Con Edison) (NYSE: ED) Chairman and CEO John McAvoy told shareholders at today's annual meeting that "solar, battery storage, wind, and other renewables will be increasingly a part of the energy landscape." He also talked about the company's $1.4 billion smart meter project, the largest capital investment in Con Edison's 193-year history, and how it will put choice, control, and convenience into customers' hands. "We've defined three clear themes in running our regulated businesses," McAvoy said, addressing the performance of Consolidated Edison Company of New York and Orange and Rockland Utilities. "Safety, for the public we serve and our employees, achieving operational excellence, and delivering an outstanding customer experience." McAvoy noted that a five-year smart meter installation program will begin in 2017. The technology will let customers integrate solar energy, and will offer real-time billing information based on actual energy use. The automated meters also will mean faster repairs during power outages, and enhance efficiency of the electric distribution system. "Our customers want new, cleaner, and more efficient energy choices," McAvoy said. "They also want more control over when and how they use power. Our customers' priorities must be our priorities." He also referred to the Solar Progress Partnership, where the state's investor-owned utilities have forged common ground with solar manufacturers and installers to address compensation and solar-project funding issues by working together, while putting the customer's interest first. McAvoy also provided an overview of the company's unregulated competitive energy business subsidiaries, as well as a new regulated business, Con Edison Transmission. "Our competitive energy businesses have really become a renewables company," said the Con Edison chairman. "We see renewables growing around the country, and we've developed a real strength around our ability to develop, implement, operate, and maintain these businesses." He noted Con Edison has invested $1.8 billion in renewable resource projects in 2015 and 2016, and now has renewable resources in 13 states. Included are large solar projects in California, Arizona, Nevada, and Texas, and smaller solar projects in Pennsylvania, New Jersey, Massachusetts, Rhode Island, Maryland, and New York. The portfolio also includes wind projects in Ohio, South Dakota and Nebraska. McAvoy also referenced Con Edison Transmission's $225 million joint venture with the state's other investor-owned utilities to build three transmission projects which will increase energy imports into New York City. He expects the continued build-out of large-scale renewables will continue to create demand for enhanced transmission to transport electricity to population centers. He also noted new investments in both natural gas pipeline and energy storage. The company has committed to invest $1.4 billion in gas transmission and storage that will serve the needs of its customers in the Northeast. McAvoy credited employees' dedication for the company's strong performance and emphasized that technology has the potential to transform just about every aspect of the customer experience. 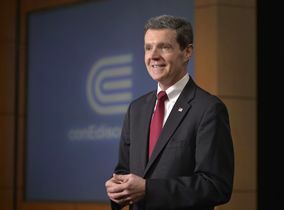 Consolidated Edison, Inc. is one of the nation's largest investor-owned energy companies, with approximately $13 billion in annual revenues and $46 billion in assets. The company provides a wide range of energy-related products and services to its customers through the following subsidiaries: Consolidated Edison Company of New York, Inc., a regulated utility providing electric, gas and steam service in New York City and Westchester County, New York; Orange and Rockland Utilities, Inc., a regulated utility serving customers in a 1,350-square-mile-area in southeastern New York State and adjacent sections of northern New Jersey and northeastern Pennsylvania; Consolidated Edison Solutions, Inc., a retail energy services company; Consolidated Edison Energy, Inc., a wholesale energy services company; Consolidated Edison Development, Inc., a company that develops, owns, and operates renewable and energy infrastructure projects and Con Edison Transmission, Inc., which invests in electric and natural gas transmission projects.